Neko Nabe is a photography book chronicling author Okumori Sugari’s attempts to raise a litter of stray kittens in a traditional farmhouse in the north of Honshū, an area traditionally referred to as “michinoku.” To scholars of pre-modern Japanese literature, this area will be familiar as the setting of Bashō’s famous haiku collection Oku no Hosomichi (“Journey to the Far North”). 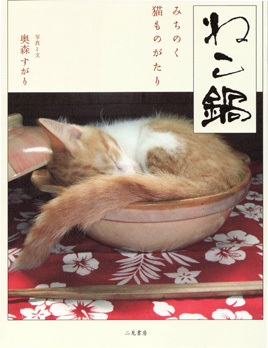 Scholars of contemporary Japan will recognize Neko Nabe itself as a major phenomenon in bookstores and on the internet. As her kittens (neko) grow older, Okumori finds that they have a habit of sleeping curled up in Japanese cooking dishes called nabe, which are used in the winter for making potluck stews called nabemono. Pictures of kittens sleeping in nabe abound, but this book has quite a bit more content to offer, especially as the photographs and text detail life in a pleasantly rural part of a country that is often perceived as overwhelmingly urban. Another joy of this book is that it is written in the local dialect. Because Okumori’s Japanese is fairly simple to understand, a student of the language should have no trouble picking out and deciphering the instances of northern dialect. For example, 先ず becomes まんず, 私 becomes おらほ, and the speech of Okumori’s father and grandmother becomes quite colorful indeed. Neko Nabe, filled with amusing anecdotes and charmingly amateurish photography, is a short, easy, and oddly engrossing read for Japanese students interested in a depiction of life outside of Tokyo. Even when the dialect gets too heavy to be comprehensible, the cats are still cute, so there’s no way to lose.